Since 2009 A.J. Excavation Inc. has set itself apart within the construction industry by becoming well rounded in all aspects of Civil Construction. From earthwork, paving, foundations, concrete, demolition & fencing, A.J. Excavation has the manpower and equipment to get the job done safely. We are very proud of our team and the commitment to excellence. For most of California we offer our expertise in cost estimating, construction management, scheduling, safety management & quality control. A.J. Excavation Inc. is a recognized industry leader with a solid reputation for honesty, integrity and outstanding performance. Founded in Fresno, California in 2009 by Alisa Emmett, A.J. Excavation has quickly grown to become one of the leading providers of civil construction services for electric utility and public works projects in Central California and throughout the state. A.J. Excavation Inc. owns and operates Massive Excavation equipment for Grading and paving. Powerful equipment is only as effective as its skilled operator. 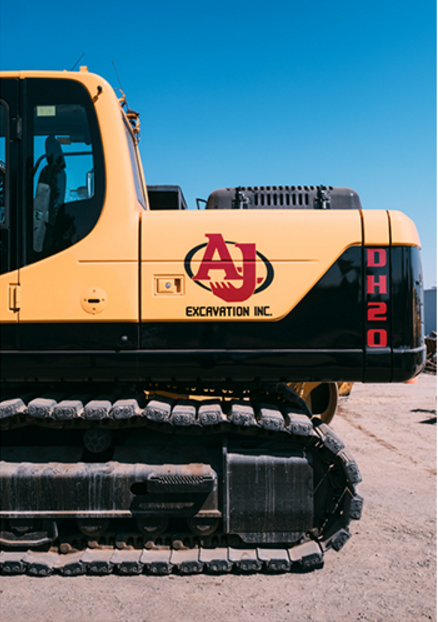 Not only do we offer one of the largest civil equipment fleets, we self-perform the majority of site preparation for our projects, controlling schedule, cost and maintaining overall project quality. As a reliable partner, we locate borrow sources, soils compaction, slope stabilization, rock excavation, manage cut and fill and safely move millions of cubic yards of earth, daily. For every project we undertake, a formal stormwater pollution prevention plan (SWPPP) is developed that complies with a National Pollutant Discharge Elimination System (NPDES) industrial stormwater permit issued by the State or the U.S. Environmental Protection Agency (EPA). This procedure ensures safe and minimally invasive construction, decreasing surface runoff rates, volumes and pollutants to our local communities. A.J. Excavation is committed to building long-term relationships based on integrity, performance, value and client satisfaction.